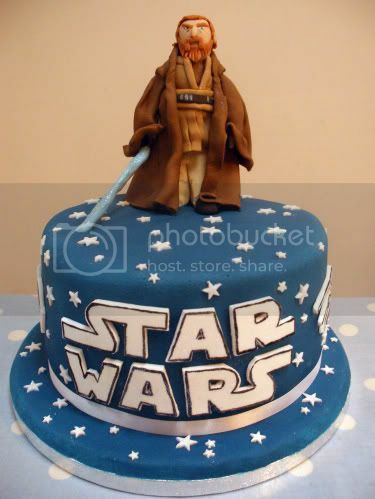 Natasha hand-made the incredible likeness of Obi-Wan Kenobi atop this fondant-covered Star Wars cake of vanilla sponge, vanilla buttercream, and strawberry jam. I only hope that my features are done such justice when a figure of me–inevitably–one day adorns a strawberry-jam cake. Just make sure there’s plenty of fondant available to recreate my humongous biceps or whatever. The cake was for a little boy called Harry, for his 6th birthday. He is a massive Star Wars fan. I get nervous doing cakes like these because I know how geeky boys and men can get. I did a Yoda cake first and my husbands comment was “If he held his light sabre like that it would cut off his hands!” But Harry was delighted. Yes, a firm grasp of basic lightsaber mechanics is frequently dismissed as “geeky.” But I bet you’ll start to think of it as “common sense” after the first time you mishandle an energy-bladed weapon. Mm-hmm. Now excuse me while I push my horn-rimmed glasses up on my nose. Check out more of Natasha’s baked goods in her Flickr photostream. Awesome. I should have kids only to justify buying ridiculously geeky cakes. Yeah it seems like that would be an unexpected perk from having kids wouldn’t it? It’s not. You have kids to get all the fun stuff and then either you can’t afford the fun stuff or your kids think *your* fun stuff isn’t fun. They think it’s strange. I’m not bitter. 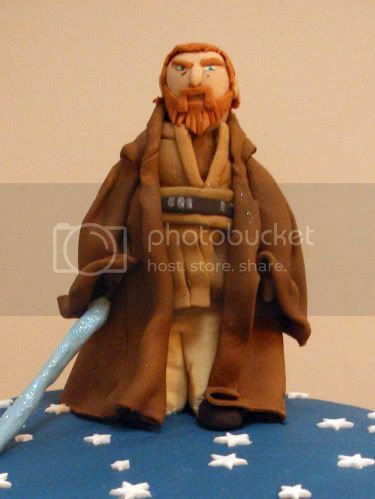 Fondant obiwan looks plenty pissed about something. I would destroy him with my mouth.